Operatives of the Department of State Services (DSS) raided the jet that brought back Atiku Abubakar, presidential candidate of the Peoples Democratic Party (PDP), to Nigeria. Paul Ibe, Atiku’s spokesman, confirmed the incident to TheCable on Sunday. Sources in the know of the incident told TheCable the DSS operatives searched Atiku and the jet, alongside officers of the Nigerian Immigration Service and Nigeria Customs Service. TheCable understands the combined security team, who said they had an arrest warrant to search the PDP presidential candidate, were looking for foreign currencies. They were said to have stripped everything including the luggage and had also searched the pilot and co-pilot. It was, however, gathered the operatives found nothing implicating during the operation. Writing via his Twitter handle, Atiku said the search was aimed at intimidating him. “I arrived to Abuja this morning to a search by agents of the state, aimed at intimidating me and my staff,” he wrote. Meanwhile, Timi Frank, ex-deputy spokesman of the All Progressives Congress (APC), says there was a plot to plant foreign currencies in Atiku’s private jet. Frank alleged that a special squad deployed by the presidency conducted the search with recording devices. He said the search lasted for hours and the squad was “disappointed” when they could not find anything implicating. 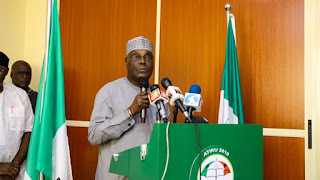 “Due to information at our disposal, I have been saying it that the PDP presidential candidate is not safe under this administration because the Buhari’s administration is deploying all manners of devilish strategies to nail all the opposition leaders especially, Alhaji Atiku Abubakar,” the statement read. Frank described the alleged plot as a “desperate to nail him”.